Management of pain or mesh exposure complications after stress incontinence surgery has become a new issue over the last 20 years with the introduction of mesh techniques to treat stress incontinence. There is much debate regarding the incidence of complications and how best to treat them. A working subcommittee from the International Urogynecology Association (IUGA) Research and Development (R&D) Committee was formed. An initial document was drafted based on a literature review. 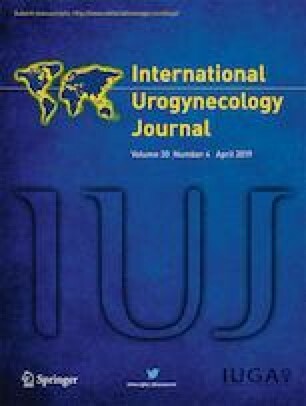 The review focused on complications of vaginal mesh inserted for stress incontinence. After evaluation by the entire IUGA R&D Committee revisions were made. The final document represents the IUGA R&D Committee Opinion. The R&D Committee Opinion reviews the literature on the management of complications arising from the use of mesh for stress urinary incontinence. The review concentrated on the assessment and treatment of pain and exposure. Complications after surgery for stress incontinence using mesh may not be common occurrences for individual surgeons. Complications may be difficult to manage and outcomes are variable. Specialist centres and a multidisciplinary approach may optimise treatment and reporting of outcomes. England NHS. Mesh oversight group report. Leeds: NHS England. 2017. https://www.england.nhs.uk/publication/mesh-oversight-group-report. Barski D, Deng DY. Management of Mesh Complications after SUI and POP repair: review and analysis of the current literature. Biomed Res Int. 2015:831285. https://doi.org/10.1155/2015/831285. Goodall EJ, Cartwright R, Stratta EC, Jackson SR, Price N. Outcomes after laparoscopic removal of retropubic midurethral slings for chronic pai. Iny Urogynecol J 2018. https://doi.org/10.1007/s00192-018-3756-6.